Single Stream Recycling refers to a system in which all kinds of recyclables such as plastics, paper, metals, glass etc. are put into a single bin by consumers. Afterward, the recyclables are collected and transported to a Material Recovery Facility (MRF) where they are sorted and processed. A benefit of this approach is that consumers or the depositors of the commodities don’t have to separate or sort the recyclables. Rather, they are encouraged to put everything that is not trash into a single bin. This approach helps to increase the quantity of material recovered, but, as we will discuss below, not necessarily the quality. 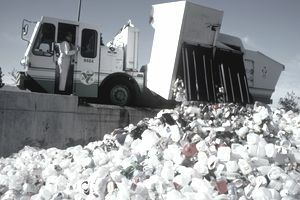 In the 1990s, several California communities started using single stream recycling and subsequently the system was adopted by communities across the United States. By 2005, around one-fifth of all locations with recycling programs in the United States were employing the single stream recycling system. By the start of the current decade, the number reached more than two-thirds. By 2012, around 248 MRFs in the U.S. used a single stream recycling system. Once the recyclables are put into curbside recycling bins, MRFs collect, sort, and process the recyclables. After processing, similar kinds of recyclables are baled and shipped to recyclers of specific materials, ultimately to be utilized in the production of new products. This is a very simple description of the process. The actual sorting process may vary with respect to the automation employed in the system, involving such technologies as conveyors, screens, forced air, magnets, optical material identification and eddy current. Let's take a look at one example. First of all, all the materials are unloaded and placed on a conveyor. Initially, non-recyclable items are manually sorted and removed. After the initial sorting is completed, the materials move to a triple-deck screen. There, all cardboard, containers and paper--items too heavy or too light for the next level of single stream recycling process, are removed. Heavier containers drop to the bottom level while lighter items head to the second. This screen also breaks the glass containers for the safety and convenience of the workers. The remaining materials pass under a powerful magnet to remove tin and steel cans. Next, MRF staff watch carefully for specific commodities that may still have inadvertently made it down the line. Lastly, a reverse magnet called eddy current causes the aluminum cans to fly off the conveyor and into a bin. Various types of fiber are separated in the single stream MRF. MRF workers separate cardboard, newsprint, office paper and drop each piece into a bunker below. Once all the materials are separated, the materials are baled and shipped to recycling companies for processing. The whole process of single stream recycling involves a combination of machine and human workers. The industry trend is towards state of the art MRFs and a move away from legacy or "dirty" MRFs which are much more labor intensive. One of the most notable benefits of single stream recycling is increased recycling rates. As the individuals or consumers don’t have to do the sorting, they are more encouraged to participate in the curbside recycling programs. Again, less space is required to store collection containers. From the point of view of the collection, costs for the hauling process are reduced versus separate pickups for different recycling streams, or the hauler having to place different materials into various truck compartments. The simple process receives greater public approval. The most notable criticism of single stream recycling system is that it led to a decrease in the quality of materials recovered. Putting all the materials into a single bin surely increases the level of contamination in terms of such problems as broken glass and the propensity to toss non-approved materials into the recycling bin, ultimately causing significant problems for MRF operators and communities. Although the consumers or depositors are not sorting the materials, someone ultimately has to sort them, making the cost of recycling higher. Ultimately, the public convenience comes at a cost. Final Note: There are both advantages and disadvantages of single stream recycling - and the battle is between quality and convenience. To this point in time, the popularity of single stream suggests that convenience has trumped quality. The use of single stream has become increasingly controversial, however, in the wake of China's more strict quality requirements for recycled materials. At least one community has reverted to a dual stream collection system to help it reduce costs. It remains to be seen if there are technological solutions such as leading edge MRFs that can offer the best of both worlds in terms of convenience, maximum volume recovering, and material quality.